RAMALLAH, (PIC)-- Three Palestinian teachers protesting outside the office of Salam Fayyad in Ramallah city were taken to hospital after their health worsened due to their hunger strike. 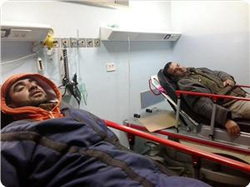 One of the teachers told the Palestinian information center (PIC) the striking teachers, Taher Asafrah, Thabet Asafrah and Tahsin Atawneh had been hospitalized after a decline in their health status. He said the teachers refused to take any medication before responding to their demands and giving them written decisions ensuring their return to their jobs. All of these teachers have lost their jobs because of what the Palestinian authority calls the "security survey." Dozens of teachers have been dropped from the recruitment lists of the PA education ministry and thus their turn to have teaching jobs were exceeded many times for alleged security reasons, while many others lost their jobs after this ministry fired them from their jobs for the same allegations as well. The protesting teachers, in turn, warned that they would continue their hunger strike and protests until the government of Fayyad responds to their just demands, and gives them back their jobs. In a press release, the teachers also strongly denounced PA minister of education Lamis Al-Alami for its press remarks to Quds Press and BNN satellite channel in which she evaded the pledges it had made earlier to them about fulfilling their demands. RAMALLAH, (PIC)-- Palestinian Authority police forces broke up a sit-in staged by teachers in Ramallah city by force for the second time on Tuesday night. Spokesman for the teachers banned from teaching in the West Bank Awad Awad said that the policemen confiscated the teachers’ belongings in the hope of frustrating a repeat to their sit-in. He said that the policemen broke up the teachers into groups and took them in police vans to different areas within and outside Ramallah. Awad said, however, that the teachers are adamant on returning to the premises of the council of ministers and stage another sit-in until their rights are restored and the agreement signed between the teachers and the syndicate is implemented in full. Meanwhile, the union of Palestinian professional syndicates denounced the PA use of force to quell the teachers in a statement on Wednesday. It called for sacking the minister of education for not living up to her promises and for not abiding by the courts’ verdicts in this regard. The union refused all pretexts voiced by the Fayyad government over the issue of dismissed teachers and declared full solidarity with them. The union renewed its refusal of Fayyad government’s dealing with teachers based on their political affiliation, and urged human rights groups to champion their cause and to denounce the use of force against those teachers on the part of the PA police. GAZA, (PIC)-- The Ministry of Education and Higher Education in Gaza has opened its first International conference entitled "Excellence in Palestinian Education, creative visions" on Tuesday. The conference's opening was attended by the Prime Minister Ismail Haniyeh, the Minister of Education and Higher Education and President of the Conference, Dr. Osama Al-Muzaini, and Advisor of the Tunisian Minister of Education and Higher Education Dr. Mohammed Graybeh, and a number of officials. The Prime Minister emphasized that the Palestinian government will work to implement the researchers' recommendations and findings, appreciating the Ministry of Education's role during the Israeli siege and war on Gaza strip. For his part, Dr. Osama Al-Muzaini, who chairs the conference, stated that this conference aims to develop the Palestinian educational process, and to prepare better curricula for the next generation, appreciating the efforts of the ministry's employees. Dr. Mohammad Graybeh has expressed his surprise by the achievements made by the Ministry of Education, saying that he did not imagine that these achievements came out of a ministry under siege and destruction. For his part, Dr. Ziad Thabit stated that the conference translated the ministry's keenness to develop the educational process, pointing out that the conference will discuss 28 research reports and 15 papers presented by 61 scientists and researchers from Palestine and from other Arab countries. At the end of the opening session the Ministry of Education has honored 32 outstanding employees. ANERA (American Near East Refugee Aid) announced in a press release that the government of Kuwait gave a donation of $1 million to fund ANERA's work with children in Gaza. Kuwait's ambassador to the U.S., H.E. Salem Abdullah Al-Jaber Al-Sabah presented the donation to ANERA Board Chair Ambassador Edward Gnehm. "Kuwait has always been a steadfast supporter of the Palestinian people and at the forefront of humanitarian efforts," said Ambassador Al-Sabah. "And, especially at this time of crisis, Kuwait is most concerned about the welfare of young children in Gaza. My government is touched by all that ANERA is doing in Gaza and wants to continue to support the programs." The donation will help fund health care and education projects aimed at preschoolers to help improve their chances for a better life. Economists recognize that investing in young children is one of the most important investments a society can make. "This generous gift strengthens ANERA's capacity to care for young Palestinian children who are the building block for the next generation of Palestinian entrepreneurs, educators and political leaders," explained Gnehm, a veteran diplomat and former U.S. ambassador to Kuwait. For more than 43 years, ANERA has been a leading provider of development, health, education and employment programs to Palestinian communities and impoverished families throughout the Middle East. In FY 2011, the relief and development agency delivered $65 million of programs to the people of the West Bank, Gaza, Lebanon and Jordan. RAMALLAH, (PIC)-- A dismissed teacher in Ramallah was carried to hospital on Sunday after his health condition worsened due to six days of hunger strike. Reliable sources at the Ramallah ministry of education said that Ayman Kawarik did not eat or drink for the past six days. Dozens of teachers, who were not employed by the education ministry despite meeting all required criteria, went on a protest hunger strike last Tuesday. Kawarik along with six other teachers were also picketing in front of the ministry since last Tuesday. More than one thousand teachers accused the ministry of resorting to the so-called security checkup, which denies citizens employment on grounds of their political affiliation, despite a court order cancelling the measure. The teachers complained to a number of human rights groups but to no avail so far. 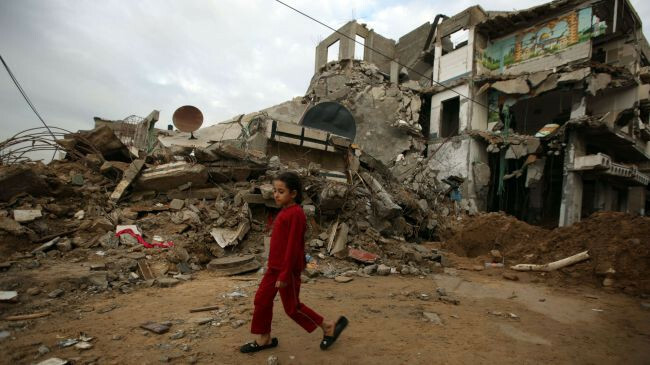 An Indonesian non-governmental organization (NGO) has announced plans to build a school in the Gaza Strip in the aftermath of the recent Israeli military onslaught on the besieged Palestinian territory. “We’ve secured a plot of land in Bait Lahiya, North Gaza, [which is] about 5,000 square meters. We will immediately kick off construction,” the director of Aksi Cepat Tanggap (ACT), Doddy Cleveland, said on Friday. The NGO also said it had secured permission and a pledge of support from Palestine’s Ministry of Education to develop the school for elementary students. “The Indonesian school in Gaza will have an environmentally friendly design, which will be easy to rebuild if the school is damaged. Basic materials will be taken from the Gaza Strip area... we will partner with the locals to build the school,” the ACT added. On November 14, Israel launched a deadly offensive on the besieged Gaza Strip, which killed nearly 170 Palestinians and injured some 1,200 others. Palestinian resistance fighters incessantly poured rockets and missiles onto the Israeli cities, killing at least five Israelis, including one soldier, in retaliation for the deadly attacks on Gaza. Egypt announced on November 21 that the Israeli regime and the Palestinian resistance movement, Hamas, had reached a ceasefire agreement. The recent Israeli aggression against Gaza caused more than $1.2 billion in direct and indirect damages. According to Hamas spokesman Taher al-Nunu, the eight-day operation had completely destroyed 200 homes and partially damaged another 8,000. Another 42 non-residential buildings, including the Hamas government headquarters, were also completely destroyed. "Since the beginning of 2006, many thousands of Palestinian foreign passport holders have been denied entry to visit, work or study in the occupied Palestinian territories (oPt). This policy has brought tremendous insecurity to Birzeit University and its financial and academic wellbeing. From March to September 2006 there has been a 50 percent drop in foreign passport holding staff, leaving most departments at the risk of being forced to drop courses and of losing irreplaceable lecturers on specialist areas. One department in particular risks losing up to 70 percent of its staff. Currently there are at least 14 faculty members who are at risk of not being able to continue teaching, and 383 students who fear deportation or prison sentences if they are caught at checkpoints. The Arabic language and culture programme is particularly at risk as it is entirely self-sufficient and dependent on their foreign students' access to the University. In the last term alone, four students were not allowed to complete their studies as they were not allowed to enter or re-enter the oPt. The programme is also a major source of emergency funds for the university, which has recently come into use to cover staff salaries since the economic blockade post the 2006 elections. Since Israel's restrictions on access to Palestinian education, applications for next term's course fell by 50 percent - taking with it 50 percent of the programme's income. However, for the first time since the prevalence of this deportation policy, the Israeli government has allocated an official to be responsible for the right to enter the Palestinian territories, Maj. Gen. Mishlav. In December 2006, Mishlav told EU officials that their policy has changed and that those given 'last permits' would be able to stay and renew their visas. However, this does not help those who are already outside and have 'denied entry' stamped in their passports, as is the case for two of Birzeit's faculty staff: Somida Abbas and Bahgat Taiam. This apparent 'promise' has also not helped one of Birzeit's best students, Fadah Ihlal Thum. Fadah is in her final year and has twice received Birzeit's rare and prestigious 'honour' award. She came to live in the West Bank in 2001, is married to a local Palestinian and has a five-month-old baby. Not only is she an excellent student, she is also a wife and a mother, and has a bright future ahead of her if she is able to complete her degree in French and English, particularly as she already fluently speaks Arabic and Portuguese. Fadah had been renewing her visa internally as is permitted to some residents until her last renewal in September 2006 when, along with hundreds of others, she was suddenly given a 'last permit' stamp on her visa and was forced to leave her home, husband and baby in December. A few days after leaving, she tried to return and was 'denied entry'. This came just two days after Maj. Gen. Mishlav made his promises that Israel had changed its policy. A new and fair policy is clearly not in place. Please write to Maj. Gen. Mishlav highlighting the three cases mentioned above and calling on him to allow ALL those who wish to study, work or be with their families in the oPt, to be allowed to do so just as they would if they were entering any other country. It is essential that a permanent solution to be found, and that proper residency rights be instated to those who have settled in oPt, and that a proper system be created for study and work visas. Please also copy your letters to your country representative in Israel in order to help build diplomatic pressure from within." GAZA CITY (Ma'an) -- Pupils returning to schools in the Gaza Strip on Saturday found many had been reduced to rubble after Israel's eight-day bombardment of the coastal enclave. 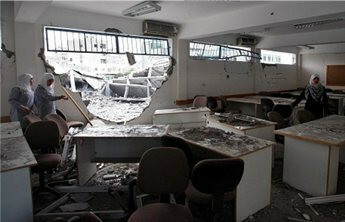 Gaza's ministry of education said 52 schools had sustained moderate to severe damage during the Israeli bombing campaign. Ministry director Mahmoud Matar said after visiting schools on Saturday that the scale of the wreckage was close to that of Israel's 2008-9 war on the Gaza Strip. He said reconstruction of Gaza's schools would cost approximately $4 million. Some were hit directly by Israeli airstrikes, while others were damaged by hits on nearby buildings, Matar said. Aid group Oxfam said earlier this week that an Israeli airstrike had destroyed one kindergarten it has funded in Gaza City, and left another damaged. The UN Mine Action Service is surveying damaged schools and found one unexploded F16 missile next to a severely damaged school in Tal El-Rabee on Thursday, the UN humanitarian affairs office said. The UN Committee on the Rights of the Child on Thursday expressed "deep concern at the devastating and lasting impact the crisis in Gaza and Israel is having on children." At least 33 Palestinian children were killed in Israel's aerial bombardment. "Destruction of homes and damage to schools, streets and other public facilities gravely affect children and deprive them of their basic rights," the committee added. Gaza ministry official Matar said the first day back to school on Saturday was dedicated to psychological support and voluntary work to clean the schools and remove rubble. Meanwhile, pupils in schools that have been destroyed will take afternoon classes in other school buildings until their facilities are repaired or rebuilt, Matar said. Headmistress of UN-sponsored al-Bureij girls preparatory school, Hanan Abu Yousif, was stunned when she found her school in pieces on Saturday morning. "The school that used to win competitions has been turned into rubble," she said. 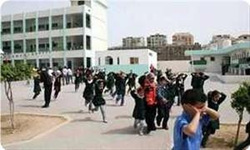 GAZA CITY (Ma’an) -- The minister of education in the Gaza Strip Osama al-Mazini said Thursday that schools will reopen on Saturday. Israel launched an air offensive against Hamas and other Gaza factions on Nov. 14 killing 170 Palestinians. The sides entered an Egyptian-brokered ceasefire on Wednesday night. GAZA, (PIC)-- The Palestinian ministry of education in Gaza said it suspended study in all schools located to the east of the Strip along the borderline due to the Israeli military escalation. In a press release on Sunday, the education ministry said the targeting of schools and the killing of students is an Israeli policy, so such measure has been taken to protect the school students, especially the children. The ministry appealed to international human rights groups to pay attention to Israel's deliberate attacks on children and their schools and to take action against such serious violation. The ministry said it would keep assessing the situation on the ground where the schools are located and would take the appropriate action accordingly. Study was suspended at the following schools: Jamal Abdul Naser, Shuhada Ashujaiya, Al-Awqaf, Subhi Abu Karsh, Bissan, Tunisia, Omar Bin Abdul Aziz, and Muaaz Bin Jabal. For its part, the Palestinian ministry of health in Gaza accused the Israeli army and its troops of deliberately targeting and killing Palestinian children and young men during any act of aggression against Gaza. "The serial bloodshed that is being carried out by the Zionist occupation army in the Strip proves that its leaders and troops gamble on the killing of our unarmed children and young men," the health ministry stated in a press release yesterday. The ministry said its statistics affirm that most of the Palestinians killed or wounded during the first third of the current month are aged between 13 and 20 years old. The ministry appealed to the international community and its human rights groups to shoulder their responsibilities towards the Palestinian civilians in Gaza and put an end to Israel's terrorism and its use of excessive against them. JENIN, (PIC)-- Israeli occupation forces (IOF) harassed students of the Arab American University near Jenin as they searched vehicles near their varsity. Local sources said that IOF soldiers and an intelligence officer in four army vehicles intercepted traffic along the AAU-Jenin road and questioned students randomly taken from passing vehicles. The sources said that the soldiers scrutinized IDs of students but no arrests were reported, noting that the soldiers had intensified their targeting of Palestinian students in the region. They recalled that the soldiers broke into an AAU university hostel last week in Zababde village. RAMALLAH, (PIC)-- Tens of thousands of students and teachers on Tuesday morning refrained from going to their schools in the West Bank causing a state of inaction on the streets which were teeming with their movement in the early hours. The general union of Palestinian teachers in the West Bank announced in a statement that there would be a general strike in all schools on Tuesday and Wednesday in protest at the unjust policies pursued by Salam Fayyad's government against the teachers. The union stressed its rejection of the policy of delaying salaries paid to teachers and demanded the banks to abide by the decision issued by the monetary authority. The union also said it refuses any kind of dialog with any side from the government including minister of labor Ahmed Majdalani and stressed the need for personally meeting with Salam Fayyad to address this issue. It held Fayyad's government fully responsible for this situation and said it is the direct result of neglecting their just demands. GAZA,(PIC)-- A prominent Palestinian human rights activist revealed that officials in Ramallah authority refused to grant for the reconstruction of the American School in the Gaza Strip. Dr. Eyad Sarraj, head of Gaza Center for Mental Health, said in an article on Monday, that the Palestine investment Fund (PIF) decided not to accept a grant of two million dollars to rebuild the American school destroyed by the 2008 Israeli war on Gaza, arguing that "Gaza does not deserve it, the best thing is to transfer the funds to other projects in Ramallah". He revealed that an American friend, worked with him to provide the necessary funding for the reconstruction of the school and managed to get two million dollars for this purpose and came to Gaza a few days ago, has informed him ofthis information. He pointed out that the American activist said that one of the senior officials at PIF, who receives a salary of hundreds of thousands of dollars, has described Gaza and its people with vulgar words not suitable to be published. Sarraj added that this situation led to many questions about the PIF and about its real mission. Has it become a part of the Israeli siege on Gaza? He wondered. Hamas rejects UNRWA's decision to re-teach "Holocaust"
GAZA, (PIC)-- Hamas’s Office for Refugee Affairs denounced the decision taken by UNRWA to teach the Holocaust to refugee school children, saying it is "a crime targeting the Palestinian refugee issue and the right of return. The Movement office for refugee affairs rejected in a statement on Wednesday UNRWA's decision, calling on the refugee agency to retreat from its decision and to stop teaching anything about the Holocaust which brings up several questions about the role played by the Agency in Palestinian refugee camps. UNRWA students do not need to learn about the Holocaust, as much as they need to be taught about their history and geography, the statement added, stressing on "the students' right to know about the massacres committed by the Zionist enemy against the Palestinian people since the Nakba until now". The office called on all the Palestinian political and civil society organizations and popular committees and staff unions in the "UNRWA" to "confront these suspicious projects, and to press on UNRWA's administration to re-teach the subjects of history and geography of Palestine." The statement added that "this serious decision led us to ask how to keep UNRWA agency as an international witness to our Nakba, and to address all projects targeting our right of return, and to fight all corrupt people in this agency in order to be a valid institution that serves the Palestinian refugees and not in a specific strata or external projects." TULKAREM, (PIC)-- The administration of Fatah-controlled "Palestine technical university-Kadoorie" in Tulkarem city threatened to use force to end the sit-in being held by students from the Islamic bloc inside the campus. The students have staged their sit-in to protest the political arrests launched against them by the Palestinian authority security forces especially during the exam seasons. A spokesman for the Islamic student bloc told a reporter for the Palestinian information center (PIC) that dozens of the university guards were deployed across the campus after dean of student affairs Munder Nasrallah instructed them to evacuate them by all means. The spokesman affirmed the protesting students refuse the evacuation orders and have the right to continue their sit-in to defend their safety and academic future. He noted that the dean told them that the governor of Tulkarem who had pledged in a meeting with them to end the campaign of political arrests against them backtracked from his pledge. There are premeditated intents to give up the students to the PA security forces, the spokesman added. Some kind of tension is still raging on campus between the students and the guards, and one student from the bloc was reportedly transferred to hospital after he fainted. AMMAN, (PIC)-- The commission of UNRWA teachers in Jordan said the agency intends to incorporate once again the topic of the Jewish holocaust into its school textbooks after it had frozen its decision in this regard for a while. According to a press release on Tuesday by the commission, confirmed thar information received from the presidency of the UNRWA suggests that its department of education plans to teach a topic about the holocaust in the agency's schools inside and outside Palestine. The commission strongly denounced in its statement the UNRWA's persistence to include such topic despite the wide Palestinian opposition to its earlier attempts. The UNRWA instead is demanded to include topics in its curriculum about the Palestinian refugees' right of return to their homes and lands they were expelled from by the Jews in 1948 as well as about the massacres of Deir Yassin, Sabra and Shatila, and the aggression on Gaza in 2008, the commission underlined. The Jordanian commission of UNRWA teachers called for an urgent meeting through video conferencing in all areas of UNRWA operations, Jordan, Syria, Lebanon, the West Bank and the Gaza Strip, to table this serious issue that adversely targets the awareness of the Palestinian students. AL-KHALIL, (PIC)-- Israeli occupation forces (IOF) stormed on Monday Al-Fakhit school to the east of Yatta town in Al-Khalil and detained students and teachers along with foreign solidarity activists inside it. Former MP Mousa Abu Sabha told the PIC reporter that IOF soldiers mounting horses escorted a jeep for the civil administration and encircled the school and tried to attack teachers, students, and foreign activists. He said that the soldiers also chased shepherds and olive harvesters and forced them to leave their land in the same area at the pretext that it was “state land”. Meanwhile, Jewish settlers cut down dozens of almond trees in Beit Ummar, north of Al-Khalil, on Monday. The popular committee against settlements in the village said that the trees were owned by one family and dated 20 years back, adding that IOF soldiers protected the settlers during their attack. OCCUPIED JERUSALEM, (PIC)-- In new racist attack, undercover units backed up by the occupation forces attacked on Thursday morning a number of students of Silwan school, sparking fear and panic among the students. Issam Abbasi, the secretary general of Silwan's central parent committee- Ras al-Amud, said in a press statement that a number of undercover occupation policemen protected by the Israeli police assaulted a number of students of Silwan elementary and secondary schools while on their way to their schools, and they tried to arrest them. The students returned immediately to their homes for fear of the forces stationed near the school. He added that the number of student in the two schools is about 2000 students aged between 7-15 years, pointing out that this is the second attack on students during one week, where a number of undercover policemen were deployed at the school last week and tried to provoke the students. He pointed out that the Israeli occupation forces (IOF) have attacked several times on the students of the two schools during the past year, beating and throwing tear gas on them while they were heading to school where they have stormed the school to arrest one of the students. For its part, Wadi Hilwah Information Center warned against attacking and arresting the students before and after leaving school by the Israeli forces leading to serious repercussions on the educational process on the one hand and on the psyche of the students on the other hand, referring to the Israeli attempt to storm al-Tur school last week. NABLUS, (PIC) -- The spokesman for teachers, who were not accepted to sit a recruitment examination in the West Bank stated that they "will not keep silent about their right to work in the domain of Education." Some teachers, after they had applied for recruitment examination according to adopted laws, were prevented from siting it because of the so called “security screening”, which the Supreme Court considered illegal. The spokesman denounced in remarks on Friday, the statements of Minister of Education in Ramallah, Lamis Al-Alami, in which she said that those who were not allowed to sit the examination may apply for it next year as the rest of the applicants. He stressed that such statements are "outside the framework of the law, and are considered a violation of the law and the rights of citizens" and demanded all those deprived of this right to organize events and sit-ins to regain their rights. A "few days ago, we were surprised because the department rejected all applicants" Said Abbas Massalmah. Abbas is a medical student from Beit Awwa village in Hebron, who left his country to Turkish republic of northern Cyprus to get his master degree at school of medicine in the department of medical biology, Massalmah was strongly surprised by his department head Prof. Nedime Serkinci when she told him that you can't begin your study in our department.
" I graduated from Arab American university in Plestine in 2011 holding a bachelor of science degree in medical laboratory sciences" Massalmah said. He decided to continue his graduate studies at near east university knowing that Abbas got his letter of acceptance by a Jordanian university services office in 24.5.2012 and they told them that your study will be commenced in 17.9.2012.
" I got a letter of acceptance which enables me to pass directly to my study without any entrance exams" Abbas said. But his department head told him that who accepted you? I didn't see your application before the university gave you your letter of acceptance. 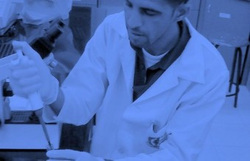 His professor told him that there are two types of acceptances at the university, the first one is called letter of acceptance which enabled you to pass directly to your study, the second one is call conditional letter of acceptance which is under the condition of passing entrance exams to be enrolled within the program, knowing that Massalmah has a letter of acceptance not conditional one. His professor decided to help him and make an interview and written exams for him and other three Turkish students, but they were surprised by the rejection of all students because they want to close the department this semester because of the absence of academic staff. Abbas added that he decided to switch to other academic program at the school of medicine, but the dean told him that all graduate programs are closed because we don't have academic staff for these programs.
" university services office and the university itself are responsible for my case" Abbas said, how does the university give me a letter of acceptance and then they ask me to be back to my country because the department is closed this semester. Palestinian student is located between getting acceptance to study in foreign universities with messages from the university services offices, and university response of not being able to start the study because of non-acceptance or claiming closing the department , and the question remains who is responsible?? KHAN YOUNIS, (PIC)-- The education ministry in the southern Gaza Strip province of Khan Younis evacuated on Monday five schools in light of the escalating Israeli raids on the area. The ministry said in a press release that a big number of Israeli shells fell in the vicinity of those schools in the early morning hours prompting it to order their evacuation fearing for the lives of the schoolchildren. The director of the ministry’s office east of Khan Younis Fathi Klub said that the evacuation fell in line with the ministry’s policy of evacuating schools at times of Israeli aggression. The ministry had earlier made exercises on evacuation of schools at times of war in preparation for any such possibility on the part of the Israeli occupation. OCUPIED JERUSALEM, (PIC)-- In a provocative step Israeli Occupation Forces (IOF) imposed on Thursday afternoon a comprehensive security cordon around Tur school, located in Tur neighborhood on the 'Mount of Olives' in the occupied city of Jerusalem under the pretext of stones being thrown on them from the school. Local sources said that the Israeli police imposed a security cordon on the school, preventing the citizens from entering or leaving. The sources pointed out that the Israeli police who were deployed in the holy city neighborhoods because of Jewish holidays claimed that a stone was thrown on them from inside the school, what led them to besiege the school. A large force of Israeli police gathered in front of the school, while families of students came to protect their children for being arrested or injured. RAMALLAH (Ma'an) -- The Palestinian Authority Ministry of Education will comply with court orders to rehire teachers fired for "security reasons" as jobs become available, the minister said Tuesday. Lamis al-Alami said the ministry had not yet received most of the high court orders to rehire dismissed teachers. "I received a court order on behalf of one teacher only, and I telephoned the head of the higher judicial council, who headed the high court asking him to send all the court orders," the education minister told Ma'an. She said the cases of dismissed teachers were dealt with individually and not collectively. In early September the Palestinian High Court ruled in favor of a group of teachers claiming wrongful dismissal by the Palestinian Authority over political affiliation. Hamas supporters working in government jobs in the West Bank, which is governed by the Fatah-led Palestinian Authority, say they have been targeted amid the rivalry between the political parties. Employees in the Hamas-run Gaza Strip have retained their salaries from the Ramallah government since the split, although they are no longer working. Al-Alami said 750 civil servants had been sacked for "security reasons" in the West Bank over a number of years. "We will rehire them, but currently there are no job opportunities," she said, adding that 300 employees were rehired when opportunities arose. The ministry is rehiring dismissed teachers, even without court orders mandating their reinstatement, she said. "We decided to rehire those teachers despite the fact that we haven't received the court orders. We decided even to rehire teachers who have not sued the ministry." Teachers are rehired on the recommendations of the general bureau of civil servants, she added. "They told us whether a certain employee was fit to be rehired or not, and the recommendations were based on security issues. However, we learned through the High Court order that the general bureau of civil servants was not authorized to intervene in appointments because that falls within the minister's jurisdiction." GAZA, (PIC)-- UNRWA operations director Robert Turner said the agency would distribute on Monday morning school kits and stationery items to Gazan students in its schools despite its suffering from financial difficulties. The school year started about one month ago in all UNRWA schools in Gaza where 225, 000 girls and boys study, but because of funding problems the students had received only textbooks. Turner said in a press release that the refugee agency would hand out today the stationery items fully to all students of its schools for this year, but he warned that the agency might not be able to sustain this program in the coming years.